Yes. The changes in my planet is never ending. I thought I was done with the improvements, but I guess I was wrong. Again. I realized this when I went to the closing out sale of the last LSS (Ben Franklin) in our area. But before I go on, I have to reiterate that I was really sad when I learned that it is going to close. I didn't ask anymore why the owner decided to discontinue their business. Other local craft stores have in the past, but Ben Franklin stayed afloat. I guess it has come to the end of its line. 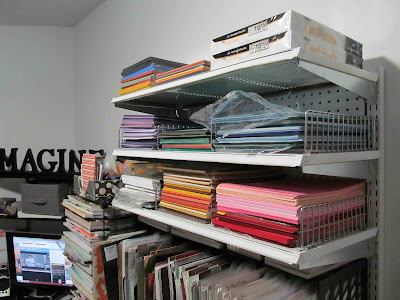 I don't want to sound mean, but when a store is closing, I always find it a good opportunity to look for display cases or fixtures that I can use for my craft room. When I was at Ben Franklin this weekend, I wasn't really looking at the items they carry, although I did buy some stamps. I was checking each fixture and display cases in the store. I knew I had to get some pegboards, and more shelves for storage. So I did. My planet was super chaotic yesterday as I moved fixtures around. 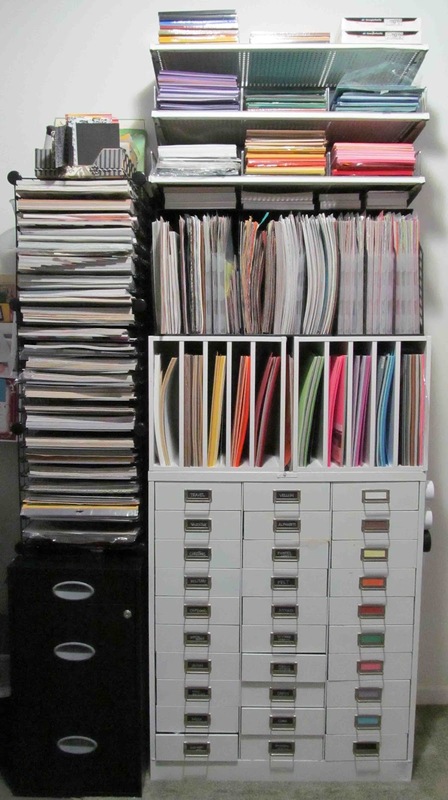 For now, I can share with you my paper station. With a small space such as mine, going vertical is the way to go. As for this particular space, I can say that I have really maximized it. 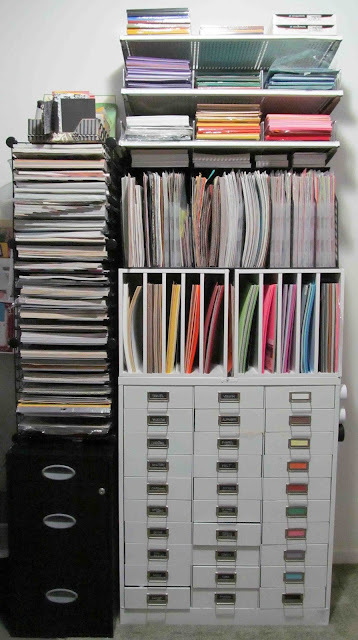 Before this came to be, my stock of paper can be found anywhere in my planet, especially the 8.5 x 11s. Now they're all in one spot. It is good storage for my ribbon, but I can't see the ones in the back and totally forget what I already have. Plus, I wanted to utilize that space a lot better, so I decided to do what a lot of crafters have done. And that is the use of plastic gutters. 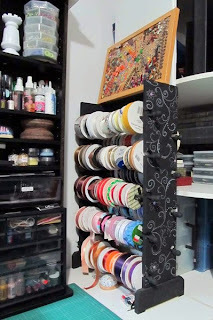 For just a little over $10 (Lowes), I now have a new place to put my ribbon spools. I put it on top of the black towers on my desk. 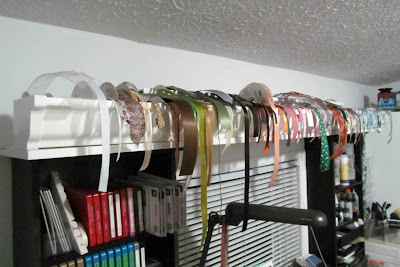 I can easily look up and see the ribbon I need, and reach up and cut. That's it for now. There are still lots of stuff to be done. I will get there. And I'm really crossing my fingers that this is going to be the last time I'll ever have to change things around my planet. And before I go, The Oozak Blog is up with their new challenge this month and it's all about SPARKLE. Hope you can join in the fun, and maybe win some fun prizes on September 30th. Click here to learn more. It looks really awesome Joan, and I´m sure, you´ll be more than pleased with how it works now. It´ll work just perfect, I can tell you, and make things sooo much easier when you work inthere. Your old ribbonholder wouls work perfect for smaller reels of ex. Washitape or simular, that comes on smaller reels, so you can see all the reels from one side, so it can be pretty cool for many other things as well. Your Planet looks really cool now, but don´t expect it to ever be finished, as I´m very sure, that´ll never happen to any of us ha ha ha. There´ll always be something we find out can be done a bit easier in another way ha ha ha. But good luck with working in your "new" planet now in the future hun, I´m looking forward to see, what´ll be created in there, that´s for sure. Have a great time ahead now.